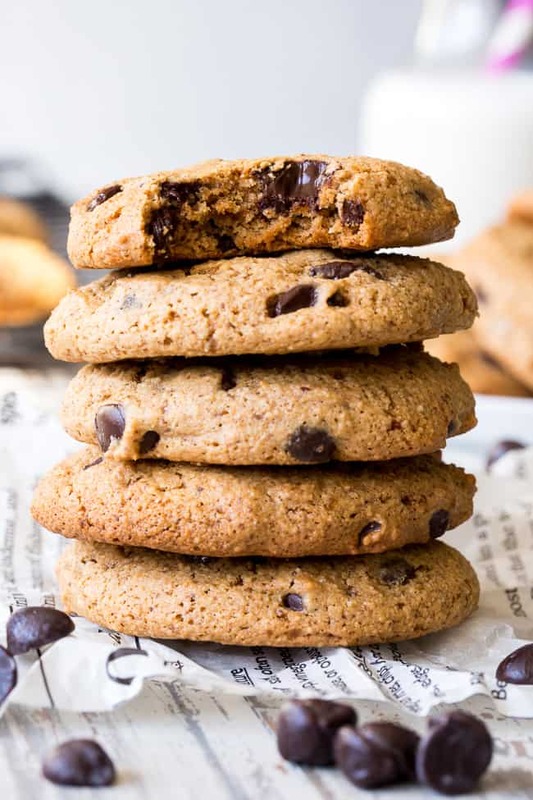 Don’t search any further for the Ultimate Soft and Chewy Paleo Chocolate Chip Cookies! 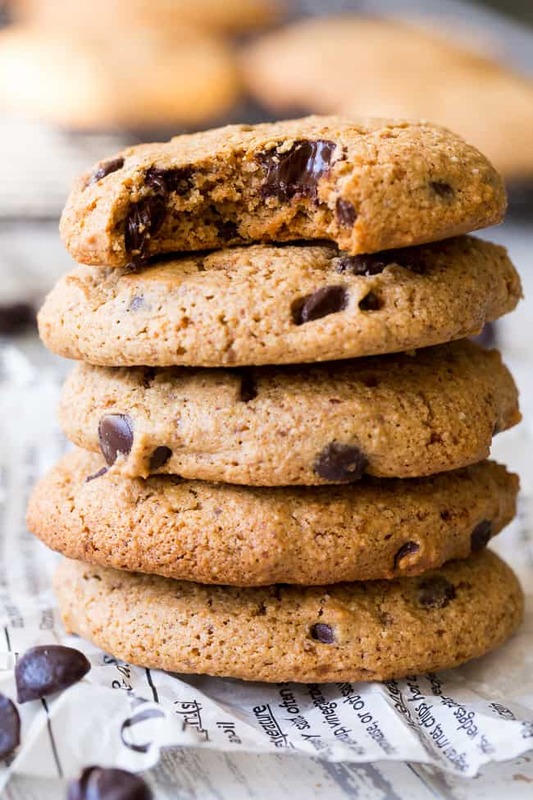 This recipe is all you need from now on when you crave a classic chewy chocolately cookie, but without gluten, grains, dairy or soy. Go ahead and make a batch (or 3) and share the love! 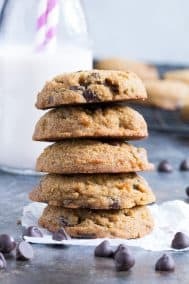 We interrupt your regularly scheduled pumpkin puree party to bring you this very important recipe for the ultimate soft and chewy paleo chocolate chip cookies! Don’t you even worry your little sugar pumpkin head off for a second though, I have more coming next week. But these cookies, they just had to say hello. 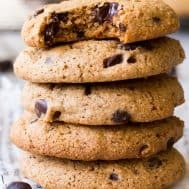 Now, I know there are a lot of “ultimate” grain free and paleo chocolate chip cookie recipes out there. I wouldn’t want the paleo police to catch me using the word unlawfully, so here’s my disclaimer: I’ve tried many paleo cookies recipes. They’ve all been pretty good, but, this is my favorite. So yes, they are my ultimate and the children loved them as well. 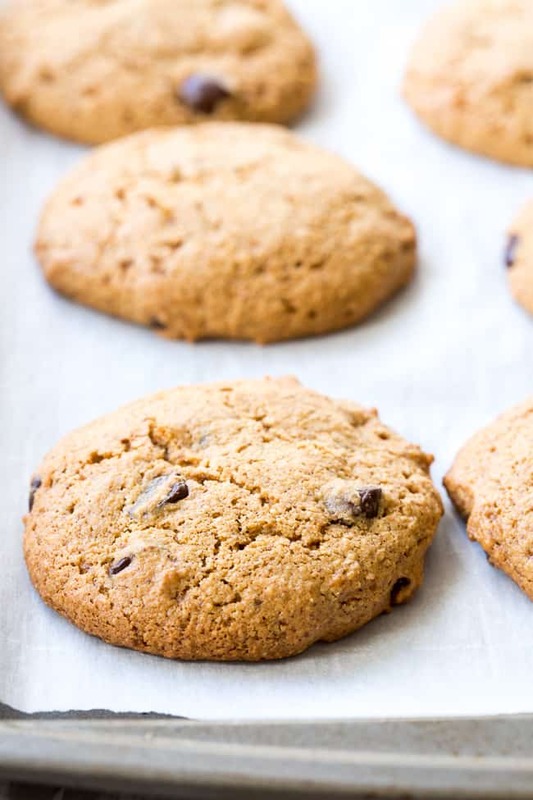 And let’s be real about who I’m baking for anyway – if three kids who still eat non-paleo cookies say these paleo cookies are the best, you trust them. Kids are extremely harsh food critics as many of you know. Gosh I’m super defensive about these cookies today! What’s gotten into me? I need to chill out – cookies are meant to be fun and tasty and that’s really it. In other news, I realized this morning while running that it was at this exact point in my training for Philly last year, that my knee started hurting. I just like to look for ways to jinx things that are going well for me – I can’t help myself. As if life really works that way. I’ve been doing this with all sorts of things that scare me since I was 5 years old and I can’t quit it! It’s comforting I guess, and even though it sounds negative it’s actually a way to relieve myself of anxiety. Because once I “pass the point” – that dividing line of time in my mind – I truly believe things will be okay. And then even if they’re not, I wasn’t worrying about it, so I can deal with whatever comes on in a mildly neurotic fashion, which for me means I’m doing well. Make sense? If not then you’re doing pretty well too, trust me 🙂 If you can relate, then maybe you should just scroll to the recipe and start making these cookies. They are a welcome distraction to all of life’s uncertainties. I promise you, they will not disappoint! 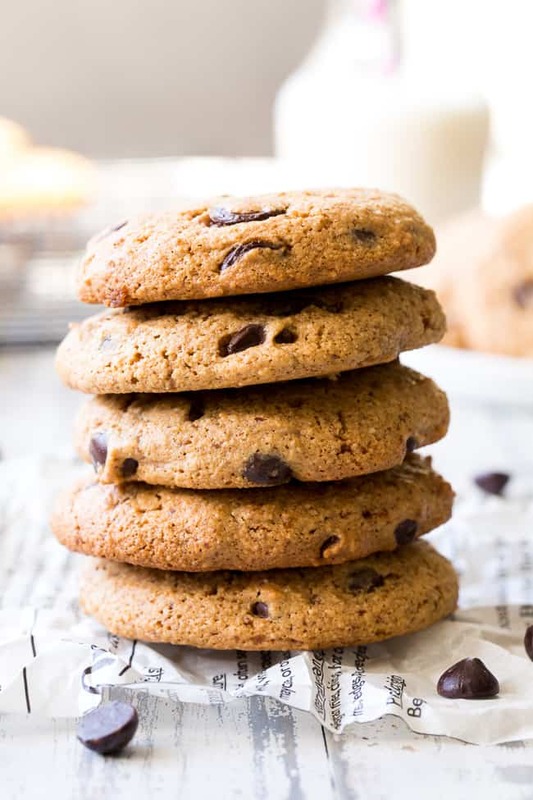 The ultimate soft and chewy paleo chocolate chip recipe that won't disappoint! These are gluten and grain free, dairy free, and soy free. 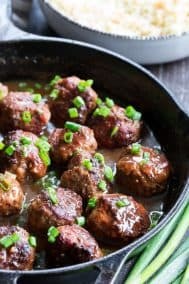 They are super easy to make and exactly what you're craving. 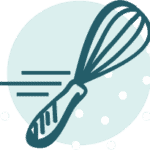 (You can mix the dough by hand, or use a stand mixer or other electric mixer.) Beat the almond butter, coconut oil, coconut sugar, maple, egg and vanilla together until smooth. In a separate bowl, combine the almond flour, coconut flour, baking soda, and salt. Mix the dry ingredients into the wet until a sticky dough forms. Add chocolate chips at the end and stir with spatula or spoon. You can chill the dough for up to 5 minutes if it's too sticky to scoop onto cookie sheet. Using a medium cookie scoop, scoop dough evenly onto parchment lined baking sheet to make 16-18 cookies. Cookies will spread a bit so leave room between each one. Remove from oven and allow to sit on cookie sheet for 5 mins, then carefully transfer to wire racks to cool completely, using a wide spatula. Enjoy! *You can make homemade paleo chocolate chunks using this recipe. Want More Paleo Cookie and Bar Recipes? Try One of These! I will definitely be making these soon! I love paleo cookies because of the shorter ingredient list and I always have everything I need to make them. And I have the same thoughts about the training timeline! But my race is the same weekend as Philly so I am relating everything to what I was doing/how I was doing last year. Yup, love the simplicity and how tasty they come out 🙂 Even though my race is earlier this year I’m still comparing everything, oy! Stop jinkxing yourself and go and make me some cookies, fool. Good job on the cookies and the picks lady! The lighting is great in these pics. Now I want to eat the 3 batches right now. Thanks! It’s still a bit hit or miss with the lighting, this week’s rain has been killing me! Thanks Leslie 🙂 So glad everyone’s enjoying the recipes, that’s awesome to hear!! Knee pain is the worst. I hope that all goes well through the end of your training. I can not wait to try these cookies! I have been looking for a good substitute to the traditional version and these look like it! Don’t want to jinx it but no pain yet, thanks 🙂 Hope you try these! I need to get some almond flour, then I have everything to make these cookies. Soft cookies for sure, no time or patience for crispy or thin or hard cookies. Soft cookies all the way! 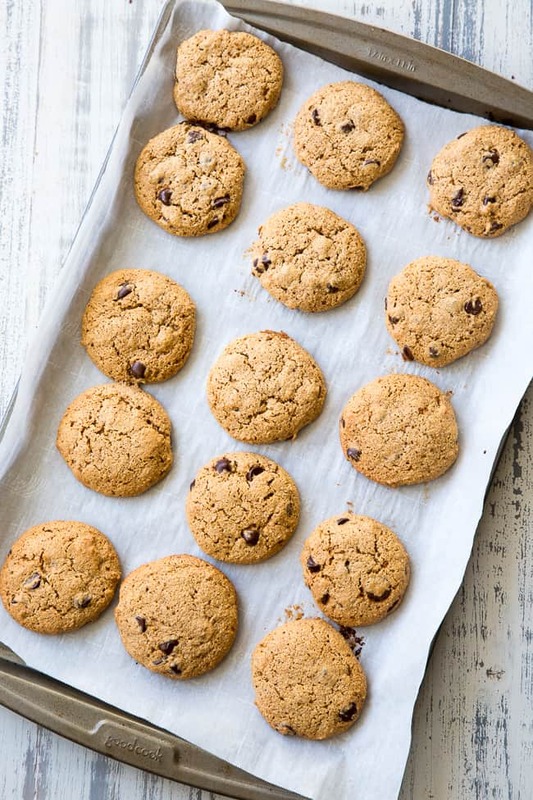 I am obsessed with your photos – I am legit craving one (or all) of these delicious cookies right now (9AM on a Friday)… I feel like this icky weather is totally going to make me want to bake some yummy treats in the next few days! Hope you have a fabulous weekend! Pretty perfect for any time! Thanks! I also call myself a realist 🙂 The more realistic I can be, the less the bad stuff hurts me. Being positive all the time works against me! Horray for cookies!! And I play those silly games too! It’s crazy what we do to comfort ourselves! 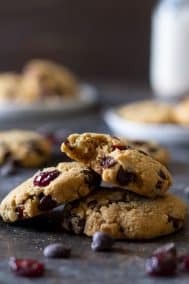 These cookies would have been a much better thing to be thinking of during that run 🙂 Certainly sharing this recipe, it looks amazing! Thanks! And I think I’m distracting myself with tons of recipes to get my mind off of training! Soft cookies are my favorite cookies, especially if there’s chocolate chips involved! I’m superstitious as well – I don’t like the numbers 6 or 13 and I’ve totally muttered Tony Tony, turn around under my breath whenever I lose something. I hope your knee stays healthy! So far it feels fine, I think I’m just losing my mind a little early this training cycle 🙂 Lots of luck for tomorrow! Chewy chewy and chocolate!!!! (Crispy is just wrong!) I always loved those chips a’hoy CHEWY chocolate chip cookies when they came out with them years ago…those were the bomb! 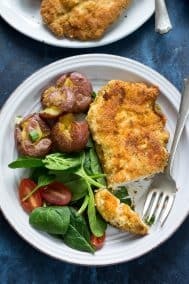 Coconut flour is great once you figure out how to use it! I just tried cassava flour (from yuca root) and it seems like an awesome gluten free & nut free option! Excited to try more recipes with it. These actually do look like the ultimate cookies!! I might have to try these. Lately I’ve gone off sweets but this recipe looks just scrumptious. Yay! 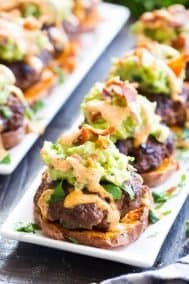 Would these work if I replaced the coconut sugar with coconut butter for sweetness? You could use a different sweetener, perhaps honey, maple syrup, or maple sugar, but I don’t think coconut butter would add enough sweetness and it would create an odd texture too. Howdy, can you use coconut palm sugar instead of the coconut sugar? Yup those two are actually the same thing to my knowledge, so either would be fine! I like both soft and crispy…definitely a time an place for both! I love these cookies. I actually found them on a different website and they’re my favorite go-to when I have a sweet tooth craving. My husband said he actually prefers these over other cookies I make. My kids love them too! 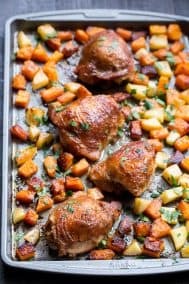 Thanks for posting this.Do you have any recommendations on how to make them crispy? 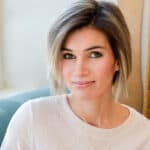 Good question – and I’m not sure at this point since I’ve only made paleo cookies that turn out chewy. I’ll have to work on it. Needed a change from my regular cookie recipe and these HIT THE SPOT. Thank you! I JUST made the chewy chocolate chip cookies OMG! I am super impressed! 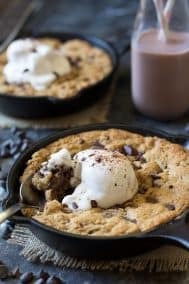 Ive tried other gluten free chocolate chip recipies and my girls would say they were O..KAY…these are thee best paleo chocolate chip cookie recipe, im not searching for a “better one” this is definatly the bomb! Yum and thanks for sharing! Just made these and they are sooooo excellent (already have eaten half the pan lol)! Best paleo dessert I have made. They satisfy a sweet tooth craving, but don’t make you feel like you just gained 10 pounds after eating them! 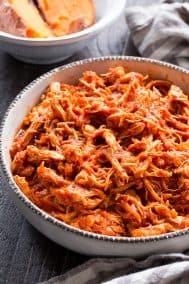 I just stumbled upon this recipe yesterday for the first time and decided to give it a try. These cookies are SO good! Especially the first ones right from the oven. They are also very easy to make. I will definitely make them again. So thrilled you liked them! a favorite for me for sure! These were amazing. Thank you for sharing this recipe. I’ll never make “normal” chocolate chip cookies again. Also, I didn’t have almond flour or coconut sugar, so I subbed in a cup of walnuts that I ground up in the food processor, and added a little extra maple syrup and they turned out fantastic. 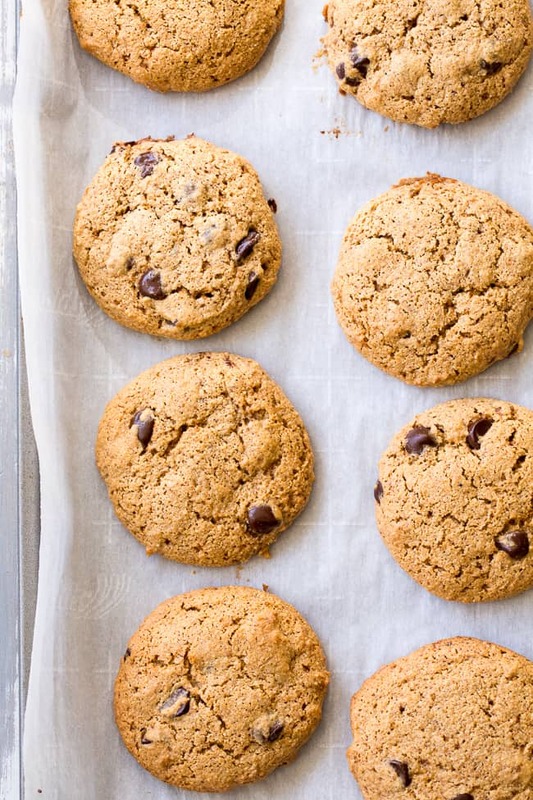 These are our favorite chocolate chip cookies. I have no need to look for any other recipe. Thank you for posting these! These are amazing! Thank you for this delicious recipe. These will be a staple in my house. This isn’t Paleo it is poison. Sugar of any kind is poison. 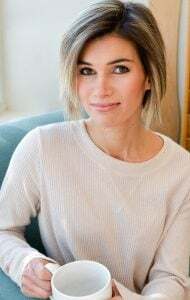 Eating chocolate chip cookies and feeding it to your kids is really not the point. My son made these and said they are wonderful and I am sure they are. I told him the same thing. The only thing humans do really well is cheat and get around reality. Seriously the best paleo cookies we’ve made in years! Wish I would’ve found this recipe sooner. Thanks!! Im not sure but i followed the instructions but they didn’t spread like the pics. Mine came out more like drop cookies didn’t have a scoop. Hello! could you sub the maple syrup for honey? Love, love, love the texture & flavor of this cookie! My 19 month old Grandson has allergies to dairy, eggs, peanuts & grains are becoming suspicious. I replaced the egg with 1 Tbl ground flax seed & 2 1/2 Tbl warm water. These cookies held their shape and were not crumbly. Crispy onthe outside, soft and chewy on the inside. Thank you! Excellent! I made with swerve Brown sugar instead of coconut sugar and maple syrup. Came out great. Thank you for indulging my sweet tooth in a healthy way.